One of the biggest and most exciting updates revealed in watchOS 4, Apple's next big OS update for the Apple Watch, was native core Bluetooth. Okay, we know that doesn't sound all that exciting but stick with us. It means that when the update rolls out in the fall, your Apple Watch will finally be able to directly talk to other devices, such as a glucose monitor, rather than rely on your phone to be the middle man. One of the companies that Apple invited to demo the feature was Xensr, which makes sensors that can be attached to surfboards to give you valuable data about your surfing session. You can see where you've surfed, how long you've been riding waves and more. Xensr is building an Apple Watch app that'll take advantage of watchOS 4's new features, which means surfers can connect their watch directly to their Xensr sensor. Not only will you be able to see all of the data on your wrist, it will also be enhanced by the fitness data the Watch captures, so calories burned and heart rate. We got a chance to sit down with Xensr founder David Troup to talk about the new app, what it was like to work with Apple and why Fitbit and its app store ambitions may be in trouble. Xensr has been working with Apple for a while now, it's first product was for the iPhone 4. When Apple went looking around for companies to show off device interoperability in watchOS 4, Troup says the Cupertino company approached Xensr. "Surfers, wind surfers, kite surfers and athletes that go underwater, they'll have their Apple Watch with them but they won't have their phone," Troup says. "So to highlight a great use case for that they reached out to us." 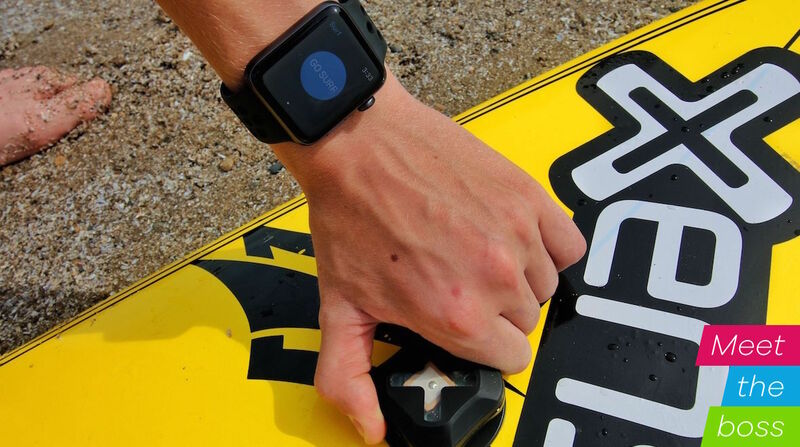 The idea behind the app was essentially to take all the data the Xensr sensors were able to push out, combine it with the data Watch sensors were able to capture, like heart rate, and combine it on the Watch to give people a more complete picture of what their surfing is like. However, Troup also says they've got "cool stuff" in the pipeline for the Watch app later this summer. Apple typically invites developers and companies participating in its keynotes to its labs to work on demo features in privacy. When Xensr got there, it noticed that Dexcom, a company that works on continuous glucose monitoring devices, was also in attendance. Both companies hatched an idea. "Just Apple having us together in the same proximity working on [WWDC] demos, we looked at each other and were like hey, I wanna put my chocolate with your peanut butter kind of thing," Troup says. "Some of the Apple engineers were surfers and had diabetes and were like 'oh yeah, totally, let's work on this, this is pretty cool stuff." The two companies are planning on cross populating their devices and services. So people using Xensr's surfing app and Dexcom's monitors are going to be able to get and see their glucose information while they're surfing. Troup says this will allow surfers with diabetes to correlate their activity information with larger trends in their health. However, Troup also warns that this feature could be far down the road because of the FDA regulations Dexcom has to go through whenever they add a new feature. "When we change our screens or change some things or do anything, we can," he says. "Those guys have to go through FDA approval every time they change a pixel on their displays." The company has worked on Bluetooth interoperability for a long time, collaborating with the like of GoPro for its Hero4 and Hero5 cameras, so it had plenty of experience coding Bluetooth. What made it so easy, Troup explains, is that watchOS Bluetooth works just like iOS Bluetooth. Developers should have a simple time getting their devices ready to talk to Apple Watches around the world once watchOS 4 arrives.Once Xensr started working on adding native core Bluetooth to its Apple Watch app, it didn't take the team long to finish. The company worked until it was kicked out of the lab at 5 that night, but when they came back in the morning they were pretty much done. "We actually surprised the folks at Apple how fast we were able to get our app up and running on the Watch talking to our devices." Despite working in Apple's private labs, and despite getting its app up and running fairly quickly, Xensr didn't know it was going to even make the keynote. Why? Because Apple was adding so much hardware to the presentation that they thought they'd get cut. In fact, Apple had so much stuff to get through they didn't talk about one of Troup's favorite new watchOS 4 abilities: power. One of the sneaky features Apple slipped into watchOS 4 and didn't talk about on stage, and one that gets Troup very excited, is added power. Despite now having two generations, the system-on-a-chip that powers the Apple Watch and Apple Watch Series 2 is the same. Performance gains on the Apple Watch have largely been down to software optimizations. Apple opening up or figuring out new ways to use the power on the Apple Watch and how it relates to the iPhone they're paired with. For instance, when the Watch first released most of the processing was done on the iPhone and the Watch was a glorified, and slow, display. That started to change in the last two versions of watchOS, as Apple started to move processing modules from iOS to watchOS. Right now, watchOS has two software processing compartments that handle tasks - one for the display and one for general processing. That's changing in watchOS 4, Troup says, allowing Apple to increase the power of the Watch by double. "What they've done in watchOS 4 is they've combined those together into one natural data processor," he says. "So a Watch 2 or a Watch 1 running watchOS 4 is going to be so much faster. From what we've seen, it's like putting a whole new processor in the device. " Xensr has seen double the processing output in its tests with watchOS 4. It's changes like these that help make Troup's argument that watchOS and Apple Watch are becoming the most robust smartwatch platform out there. Troup wasn't a fan of the original Apple Watch. He's not really a fan of most smartwatches, actually. For a long time, he wore an analog mechanical watch on his wrist. The Apple Watch Series 2 changed all of that. "To replace that watch with something else is a big deal for me," Troup says. "All of the Android Wear watches, all of the watches we've gotten I've always said 'OK I'm going to use it for a month regardless and experience the device in its natural element.' When I put the Apple Watch 2 on my wrist, within about a week I said Apple is underselling this thing." Specifically, Apple is underselling how much power the Watch has, how much battery life it's capable of and how it slowly but surely changes your relationship to the other technology in your life, according to Troup. Compared to the competition, Troup doesn't see a contest. "If you look at Suunto and the Garmin watches, especially the ones that do a lot of things that are really robust, outdoor watches," he says. "First of all, they're huge. They're huge. They're absolutely monstrous, they're like literally more than double the size. And they're also, in a lot of cases, double the price. Those watches are in the $600 to $800 range, it's kind of nuts." What about Fitbit? Those devices are affordable and allow people to keep track of their fitness. However, Troup thinks they're mostly good at general fitness stuff. When it comes to apps, you're stuck using all of their apps on the actual device. Fitbit is looking to build an app store for its upcoming smartwatch, which would allow both consumers and developers more freedom to stretch their legs in the Fitbit ecosystem. There's one problem though, says Troup. "If you think about all these app developers building fantastic apps on the watchOS platform for Apple Watch, how does Fitbit compete against that?," Troup wonders. "They bought Pebble, but I don't see that going anywhere. The reality is if you're not Android Wear, if you're not watchOS, forget it. That's just the reality of it." Meanwhile, Troup says Apple is building watchOS into a robust and mature development platform. While watchOS is a subset of iOS, Apple has gradually improved its capabilities and made it more in line with what iOS is capable of. These are features like native core Bluetooth. But it's also the ease of development. That ease gives it an advantage over something like Android Wear. "What we did for Apple we had done in the past for Android Wear, and doing it for Apple was on orders of magnitude easier to do it on Apple Watch than it was to do on Android Wear," Troup explains. "You can't even compare it. It's literally night and day." There are a couple of reasons for this. First, hardware conformity. There are only a couple different hardware iterations of Apple Watch, and they're mostly the same. Android Wear watches, on the other hand, can be wildly different. So when developing for Wear Xensr has to find as many as it can and then fine tune for each specific watch. When the company finds a couple partners it would like to work with more in depth, Troup says they aren't developer friendly. And finally, since watchOS is working more like iOS now, the learning curve to porting features like native core Bluetooth is simple. There's also the keynote itself. When Apple stands on a stage and announces a big new feature, like native core Bluetooth, Troup says it's a huge thing for developers. "That signals to product manufacturers like us - and we're small, we're very niche - all the way up to larger organizations with thousands of employees that do general consumer electronics that Apple is the platform to bet on."